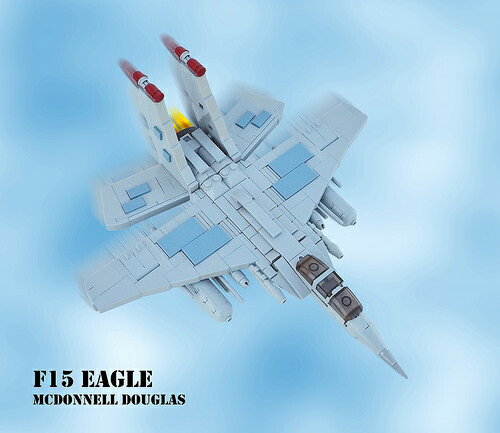 The F-15 is a twin-engine, all weather fighter that is the mainstay of the U.S. Air Force’s air superiority and homeland defence missions. Boeing boasts that its proven design is undefeated in air-to-air combat, with more than 100 aerial combat victories. Kai NRG has a special reason for building a LEGO version of this particular jet fighter, his grandfather worked on developing the aircraft. He has certainly done a very good job, the shaping is fantastic with SNOT building giving a wonderfully smooth, streamlined appearance. Just in case you didn’t spot the working flaps in the main image, this view shows the added functionality in Kai’s design.